The new DD14 series from SCHURTER packs remarkable functionality into a new generation of compact power entry modules. 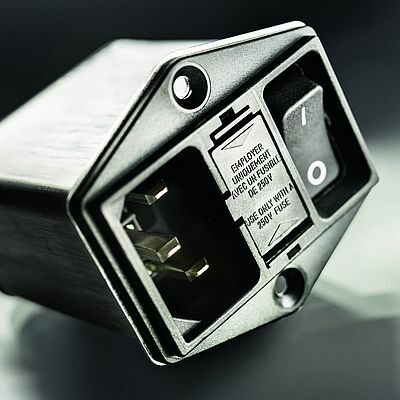 The new DD14 combines an IEC C14 appliance inlet with 2-pole switch and 2-pole fuseholder. EMC performance is further enhanced with a depth-saving 2-stage filter. Shielding is optimized by screwing the metal casing of the filter to the panel, using its horizontal or vertical flange. A snap-in filter version eliminates the flange, consuming even less panel space. Standard and low-leakage medical filter options are available for use in commercial or facilities ICT equipment according to IEC 60950 and medical equipment according to IEC 60601-1. The series meets the new fuseholder requirements outlined in IEC 60127-6 for enhanced fire safety and is also suitable for use in home appliances according to IEC 60335-1. It is compatible with V-Lock retaining cordsets. The DD14 is rated for current levels up to 10 A / 250 VAC according to IEC and 8 A 125/250 VAC according to UL / CSA. It is ENEC and cURus approved.